Conservation International (CI) partnered with Blue Raster to analyze and map an enormous marine species dataset—an initiative that will help CI prioritize areas that should be targeted for biodiversity conservation. Marine biodiversity faces growing threats from climate change, run-off pollution and overfishing. Coral reefs, for example, contain more than 25 percent of all marine species, but 75 percent of the world’s coral reefs are now threatened by human activities. To confront these threats, CI is working with governments and conservation organizations worldwide to establish marine protected areas (MPAs). 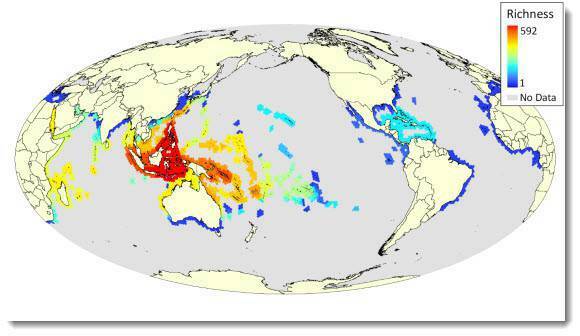 To analyze CI’s dataset of more than 11,000 marine species, Blue Raster indexed spatial data using the c-squares system and then aggregated c-square values to a global hexagon layer, which covered the planet in around 200,000 equal-area hexagons. Each hexagon was analyzed for marine species richness and rarity. In total the database contained over 230,850,000 rows. Using ArcGIS Desktop with ArcPy and Esri’s Spatial Analyst Extension, Blue Raster produced a data analysis that allows CI to identify places in the ocean with the highest species richness and areas most threatened by human activities, as well as those that are most pristine. CI can also use the analysis to map areas with the most endemic species. These maps will help CI pinpoint locations with the greatest need for designation as a marine protected area.